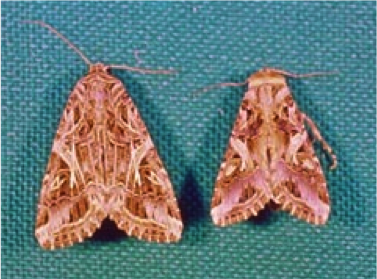 Figure 8.7: In tobacco cutworm moths the male (right) is smaller than the female (left), but similarly colored. At the most basic level, the life cycle of an insect is comprised of the egg, juvenile (typically called larva or nymph, we will use the term larva throughout this module) and adult stages. Some insect types include another stage that will be discussed below. The eggs are typically laid externally (like chickens!) and are small and inconspicuous. The larvae are the “eating and growing machines” and the adults are the “reproductive machines.” Most, but not all, insects reproduce sexually and have male and female reproductive structures in different individual adults. 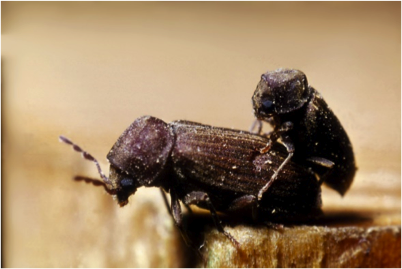 Figure 8.8: In this wood boring beetle pair, the male is smaller than the female but similar in color. Depending on the species, male and female adults can look similar and be of similar size; however, sometimes males and females are colored differently with the males being more brightly colored than the females (like birds!) and sometimes the females can be larger than the males. Female adults produce eggs in their reproductive structures and male adults produce sperm in their reproductive structures. Egg and sperm production are controlled by hormones and can be influenced by environmental features. Eggs are fertilized by sperm during mating and female adults typically deposit the fertilized eggs into the environment. 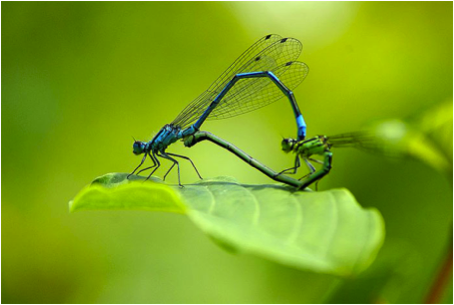 Figure 8.9: In this damselfly pair the male is bright blue, while the female is light green. The word metamorphosis is an appropriate word to describe how an insect develops from an egg to an adult. First, the eggs hatch into the larvae. Second, the larva eats and grows. However, growing is a bit complex for insects because they must shed or molt the hard exoskeleton in order to grow! The number of times a larva molts prior to becoming an adult depends on the species, but the stages in between molts are called instars. Some insects change a great deal as they go from a larva to an adult, others change very little. Although there are some more complex and some intermediate types of metamorphosis, the two general types of we will talk about are simple (or hemimetabolous) and complete (or holometabolous). The main difference involves the number of stages and how wings develop. In this module, we will follow some of the steps involved in courtship and mating and the process of metamorphosis. Figure 8.10: Male and female cabbage butterflies are very similar in size and color.